The unforgettable team of Scott Snyder, James Tynion IV, Jim Lee, John Romita Jr. and Andy Kubert combine forces to set the stage for the epic event Dark Nights: Metal with Dark Days: The Road to Metal. <br />For years, Batman has been tracking a mystery. Hes quietly been pulling a thread, conducting research in secret laboratories across the globe and stowing evidence deep in the Batcave, hidden even from his closest allies. Now, in an epic story spanning generations, the heroes and villains of the DC Universe, including Green Lantern, The Joker, Wonder Woman and more, are about to find out what hes discovered—and it could threaten the very existence of the Multiverse! 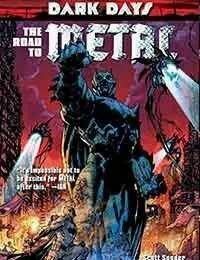 <br />This edition collects Dark Days: The Forge #1 and Dark Days: The Casting #1, as well as classic DC stories that built the foundations of Metal, including Final Crisis #6-7, The Return of Bruce Wayne #1, Batman #38-39, Nightwing #17 and more!